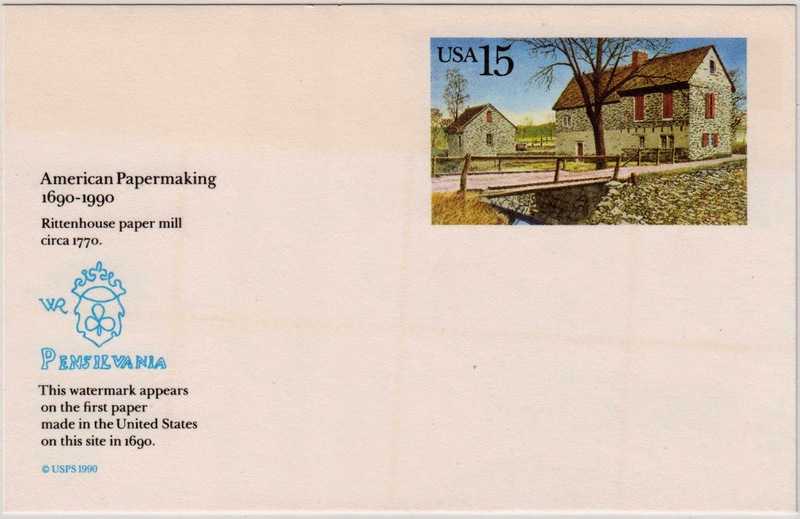 Postcard US-2849009 to the Netherlands was a postal stamped card to celebrate 300-years of American Papermaking from 1690 to 1990, issued by USPS at the annual meeting of the American Paper Institute in New York City on March 15, 1990. The American Paper Institute and the National Forest Products Association merged on January 1, 1993 and formed the American Forest & Paper Association (AF&PA). The card shows a painting of the Rittenhouse Paper Mill, established near Germantown, PA in 1690. The painting was based on black and white photographs, circa 1770, of the most recent mill that lasted until the late 1800s. The original paper mill, first in America, was washed away by flood in 1700; a second mill constructed in 1702, was destroyed by a fire. A reproduction of the original Rittenhouse watermark is featured on the left side of the card with a note "This watermark appears on the first paper made in the United States on this site in 1690." According to an article in Times-News from Hendersonville, NC on April 1, 1990 and an article in Lawrence Journal-World from Lawrence, Kansas on April 8, 1990, collectors had until April 12, 1990 to obtain the first-day cancellations. It also noted that the Postal Services gave preferential service to customers who bought cards at a local post office, self-addressed them before sending them in for cancellation. If customers preferred to have the Postal Service supply the card, they needed to send, for each card ordered, payment of 15 cents in the form of a check or money order and a self-addressed, peelable label to a New York City post office. Now a days, USPS sells a postal stamped card for the face value plus a mark up. For example, a Tree Stamped Single Stamped Card sells for 38 cents with a first-class FOREVER postcard rate (currently at 34 cents) postage. Coincidentally, the postcard arrived in the Netherlands yesterday when the Dutch National Soccer Team defeated Costa Rica 4:3 in Penalties at the 2014 FIFA World Cup.